One of my friends who reads you said reading your stuff is like getting a graduate level course in political economics. You’ve said that various colleges have asked that you teach. You should suggest to them that they simply require their students to read your on line postings. I am curious as to how many “Hits” you do get on your blog entries. Be nice to know how many of us are around, subtracting maybe 10 percent for the NSA and all the other enemies you’ve acquired of course. LOL. I do have a question though. You have said that there is no way the dollar can go into hyperinflation as a reserve currency and I understand that. Stagflation rules. However, after the initial crisis, if the dollar reserve system dies and we go to electronic money and a new one-world reserve currency, would hyper inflation then be possible for the dollar system?? It would seem electronic money opens up endless possibilities for pumping. Also, You have mentioned putting out four books this year I believe?? Could you let us know what they are about?? ANSWER: We have a little over 600,000 unique visitors to our various sites. We will be opening up Socrates of course, but what will probably add millions will be our China sites. While we are translating the site into Russian for that region of the world, Mandarin in our next big project. Yes, Google can translate a page. However, when it comes to these complex subjects of finance and economics, you need to translate directly using people who know how to translate the terms. Sometimes simple terms like “bull market” cannot be translated literally or they will think you are talking about beef. As for hyperinflation – no core economy has EVER gone into hyperinflation largely because there are way too many complex trends that collide. The hyperinflation unfolds in governments who have lost all credit worthiness and cannot sell bonds. The revolutionary army in German defaulted on the government debt. Hence, they were reduced to printing because nobody in their right mind would lend them a rotten potato. Therefore, the very idea of hyperinflation will result is civil unrest and revolution before you ever got there in a highly social state as we have today. Just the invasion of Russia and taking over the government in these Eastern provinces of Ukraine creates economic chaos in a social state. The elderly were getting pensions from Kiev. That stops. This is why not everyone wants Russia – it is a bottom line and a huge unknown will they receive the same benefits? Will they be able to eat? These are collateral question that people never consider. The fall of Communism when the state-owned all property meant that now you got to own your property. Suddenly, people owned houses, apartments, and farms with no debt. Western banks rushed in offering credit card based upon this new collateral. A classic example of social chaos with the change in government comes from China – the first country to invent PAPER currency, albeit Ancient Egypt had a similar system absent paper – they were warehouse receipts recorded in clay. 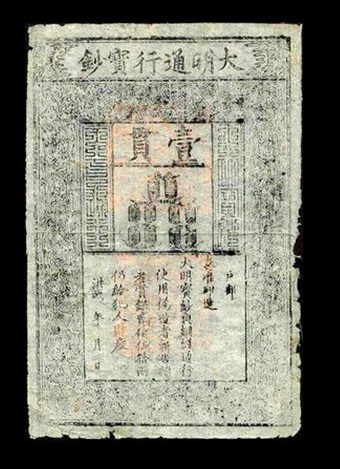 When the Mongols invaded China, under Genghis Khan establishing the Yuan Dynasty by his successor Kublai Khan was forced to honor the paper money that was in circulation. If he did not, the economy he wanted to rule would collapse. Therefore, you do not hear about the fiat paper money systems that did not go into hyperinflation and lasted for almost 1,000 years. There is ZERO chance of hyperinflation. That also PRESUMES government will honor its unfunded liabilities. Just open your eyes. They are doing everything possible to trim the sails. Eventually, they will create a new currency, default on the obligations, and we get a reset. This is where tangible assets come in. ALL ASSETS survive such a rest PROVIDED there is no war that results in the destruction of the infrastructure as we saw after World War II. You cannot forecast the future with no understanding of the past. We acquire knowledge through EXPERIENCE. Anyone who thinks experience does not count are the classic bureaucrat for every single financial crisis that hits, they do what they THINK will work and NEVER do they ever consult the past to ask has anyone tried this before and what was the result? EXPERIENCE separates wisemen from just the typical ranting lunatic who likes to hear himself talk. In every other science we build knowledge upon the collective experience of those before us like in physics. Only in this area of social economics are we confronted by people who want to tell the world how it should be run who have zero experience and do not bother to even consult history. Hence, they make great politicians and snake-oil salesmen, but when the sophistry runs dry, we see they are not made of gold after all despite their claims of always being right or superior to others. This is why I NEVER offer my opinion, for opinions as they say are like assholes, everyone has one. All we can do is consult the past to understand how this really ticks. What anyone “thinks” is irrelevant. As far as books, there is in the final editing stages the world economy from 1900 to 1945 following the capital flows for the boom and the bust of the Great Depression with the truth rather than fiction and that includes the Sovereign Debt Crisis that Galbraith left out of the seminal work on the period entitled the Great Crash. There is a study of the world economy and all the different types of governments from the dawn of civilization to the present. Here too, I have gathered together even Chinese history that documents that Marcus Aurelius (161-180AD) had sent ambassadors to China. They recorded that info omitted from Western history. This demonstrates there was a world flow of capital that existed even in ancient times with booms and busts in emerging markets and the same patterns over and over. Then there is a book on economics to rival Piketty hopefully showing the truth rather than selected fiction to support one view. Then there is the Geometry of Time on cycles documenting their existence in all fields of science and why. 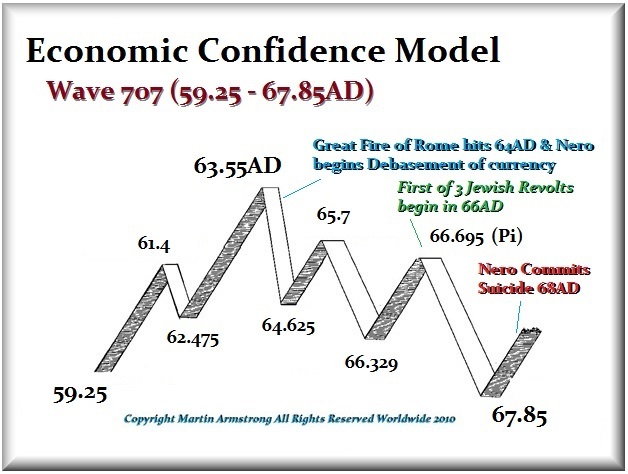 Then there is the Economic Confidence Model with each wave reviewed throughout history. Most of this has been written. I just hired an editor to start on the first one. It is just a lot to get through besides working on the computer. I am trying to get this out while I still can.